He has been rocked by reports that his ex Kate Wright’s fairytale proposal has caused him to seriously re-think his relationship with girlfriend Amber Turner. And a source has now exclusively told MailOnline that Dan Edgar is in fact going through a rough patch with the blonde – however has hit back at claims that their issues stem from his former flame’s exciting news. The pair were said to be immersed in an emotional conversation while filming scenes for TOWIE on Sunday. And now the source has confirmed to MailOnline that the pair have been going through a tough time – but it has nothing to do with Kate and Rio. This comes hot on the heels of reports that his ex’s happy ending ‘put things into perspective’ for Dan. A source recently told The Sun: ‘Things have been rocky between Dan and Amber. He’s not really sure what he wants and has been confiding in his family and friends, asking them what to do. ‘He hasn’t been happy for a while and now, with Kate and Rio getting engaged, it’s put things in perspective. Is there any point continuing the relationship if Amber is the wrong girl for him? ‘He’s tried and of course he loves her so they’re trying to make things right. But everyone’s worried they’re about to split,’ it was continued. 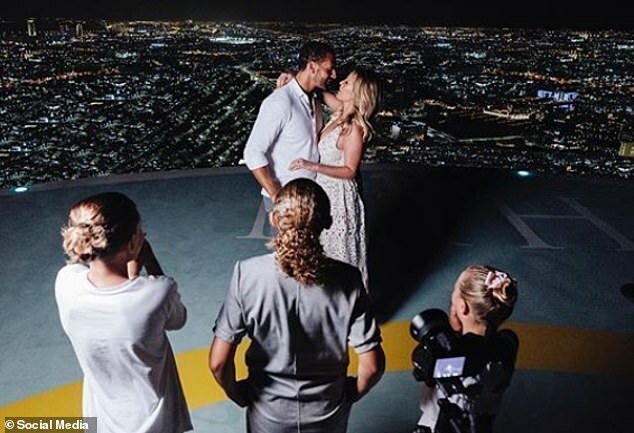 On Thursday, Dan’s ex Kate, 27, told fans she had accepted a romantic rooftop proposal from the sports legend, 39, during a family holiday to Abu Dhabi after he popped the question in front of his three children. Kate uploaded three pictures of the magical moment Rio popped the question as his kids Lorenz, 12, Tate, 10, and Tia, seven, looked on. While Dan has since moved on with TOWIE beauty Amber, the news may still come as a shock as the TV personality previous told BANG Showbiz that he would ‘always have feelings’ for Kate. Later speaking to the Daily Star Sunday, Dan admitted he was surprised Kate was dating the football pundit, dishing: ‘I didn’t think he would be her type at all. Kate and Dan dated on and off for over six years after meeting during an Ibiza holiday in 2010. The former couple’s relationship was one of TOWIE’s leading storylines before Kate quit the show to pursue her romance with Rio.